This Distincively attractive Shirt Jack is breezy and soft like a knit but with the look and texture of cord. Wear as a light-weight jacket or shirt. Full-snap front, long banded sleeves you can push up, and inset side pockets. A great outfit addition to keep on hand for those cooler days and nights. Mid to lower-hip Length. SEE SIZE DETAILS in Size Selections. 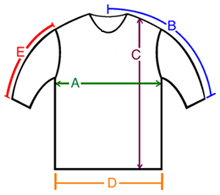 A: Chest / Bust circumference 40-42" 42-44" 44-46" 48-50"
B: Sleeve length from center of neck to end of sleeve 30.5" 31" 31.5" 31.5"
C: Body length from shoulder to bottom of hem 26.5" 26.5" 27.5" 28"
D: Hem circumference 42" 45" 47" 52"
E: Sleeve length from shoulder to end of sleeve 23.5" 24" 24" 24"
The sky blue is one of my favorite colors, and I love the relaxed fit and soft feel of this corded cotton. (41" Bust, and I can use the Medium as a jacket over a fitted tee). This one will be in my closet for years!